The winner of TV's X Factor talent show has scooped the Christmas number one spot in the UK singles chart. 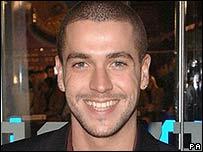 Shayne Ward's song That's My Goal entered the chart at number one after only four days on sale. A spokesman for the 21-year-old said 742,180 copies had been purchased in stores and as an internet download. Last week's number one, folk-pop group Nizlopi's JCB Song, fell to number two, while The Pogues' reissued festive song Fairytale of New York was new at three. It originally went to number two in 1987 and was re-released to coincide with the fifth anniversary of the death of Kirsty MacColl, who sang on the track alongside Shane MacGowan. The group said proceeds would go towards a campaign for an investigation into the death of MacColl, who was hit by a speedboat in Mexico. Shayne Ward's recording was rushed into production after he beat thousands of hopefuls to win the ITV talent show on 17 December. "I am so thrilled that my single is the Christmas number one," Ward said. "Thank you to everyone who bought That's My Goal and all the thousands of people who voted for me on the X Factor. "You have made my dream come true - I am still in shock and am completely overwhelmed." Bookmakers stopped taking bets on the Christmas number one after Ward's opening day sales passed the 313,000 mark. William Hill said the singer's success had resulted in their "worst Christmas result ever" and estimated that more than £500,000 would have to be paid out across the industry. The other new chart entries included Eminem's When I'm Gone at number five, Girls Aloud at nine with See The Day, and Coldplay's Talk at 10. Eminem's compilation Curtain Call - the Hits remained at number one in the album charts. Charity single Band Aid 20's Do They Know It's Christmas? clinched the festive number one spot in the singles chart in 2004.